What one small thing can you do RIGHT NOW to get you started on your change? If it is a habit adjustment that you have a 90%+ likelihood of succeeding at – even better. This will at least get you started while we do the detailed planning. The bigger, more dramatic the change you wish to make – the more important the process of planning is. The target is NOT to develop a bulletproof plan. Planning helps you see where you are at, determine what you have to work with, help you figure out some steps to get where you are going, and create ways to better ensure success. Mary Lippitt in 1997 compiled an early framework for complex change. Footnote: Unfortunately, I am not able to find a clean citation for Mary Lippitt’s model. One of the best explanations can be found here: https://reveln.com/two-tried-true-change-models-evergreen-for-agile-change/ . Though her model lends itself to pictographic representation, she has recently (2017) sued the Mayo Clinic for copyright infringement for using a widely circulated graphic illustrating this model. https://copyright.byu.edu/content/mayo-clinic-sued-using-copyrighted-charts-training-courses-0 . Perform a google search if you need a picture or work directly with Dr. Lippitt’s consultancy if you require further guidance. Without vision, you get confusion. Without skills, you get anxiety. Without incentives, you get resistance (or you just don’t follow through). Without resources, you get frustration. Without an action plan, you get false starts. I have found that this is true on a personal level, as well as on an organizational level. A challenge many of us face when trying to make change is that we attempt to create change – personally and organizationally - while missing one of these components. In a personal change context, we are responsible for having the vision for what we wish to accomplish with the change. From there, inventorying and collecting skills, incentives, and resources is a pre-change activity. We have the beginnings of this information from our Change Planning exercise in the previous chapter. Do you have the skills you require, or do you need to learn them? Is there an option to have someone who possesses the skills help and/or mentor you during this process? What incentives do you have for success? What do you expect to get out of the change? How will this change impact others? Are there any external incentives that you can use to help motivate you when the journey gets tricky. Do you have the resources you need to be successful? Do you need to collect these resources from elsewhere? What are your options? I’m going to assume we are moving forward with the change we wish to make right now. You may change your mind as you go through the exercises in this chapter. That’s great! It’s better to find out you don’t quite have what you need before you really get going than to have people relying upon you to do something in a certain time frame while you are missing the skills and resources to do it. Inventory analysis – What gaps do we have before we even start and how big are those gaps? Creating the Plan – What do we need to do to make this change successful and when do we need to do it? What do we have and what is missing? How big is the leap between here and there? Typically, we consider “inventory” in terms of material things. How many items do you have? However, there is another form of “inventory” that is deeply personal. 12 Step programs use “inventories” as a key step in their process. The idea behind the inventory is to uncover some of the patterns, beliefs and resentments that no longer serve us and to reveal our part in these interactions. For our purposes, we don’t need to go as deep in our inventory as the 12-steppers. That type of inventory is often uncomfortable and can easily lead to self-flagellation without skilled guidance. That said, I do feel that going through the 12 steps, whether you are recovering from addiction or not, is a powerful way to get to know yourself. Though I am no longer active in 12 step groups, I have found myself repeating the 12 steps (guided by a therapist) during periods of significant growth. YMMV. We’re going to focus our efforts on what we have within us that will help us with the change we wish to make. Our inventories are also going to include the people around us, the systems, and the materials we have on-hand. One way to look at our inventory is through what is fondly called a “SWOT” analysis. In a SWOT analysis, we are looking at the strengths, weaknesses, opportunities, and threats we are working with as we make our change. What strengths do we have that will help us with this change? Where are we weak or missing information, resources, skills, or support? What opportunities might surface as we execute on this change? What threats might we encounter that could derail us? As we go through our inventory analysis for each quadrant, we are going to look at this through the lens of strengths, weaknesses, opportunities, and threats. I will walk you through this process later in this chapter. The type of plan you will create depends upon the type of change you are wishing to make. Give us a baseline for adjustment if we have made an incorrect assumption, a risk has surfaced, or an opportunity presents itself. Plans are meant to be working, living things. The bigger the effort, the more likely the plan is going to change as you execute your change. Failure to follow a plan is an opportunity to learn something. It is NOT commentary on your discipline, your planning skills, or your being. The type of plan you will create is dependent upon the type of change you are making. Permanent Habit plans will be very agile and “of the moment.” The main question to ask is “What can I do where I have a 90% chance of success.” Attempt to execute. Are you successful? If no, ask yourself what happened and what lesson you learned. Then, if you decide to continue, determine an easier goal where you have a 90% chance of success. Permanent Habit plans are all about experimentation. Test, analyze the results, adjust, and try again. Implementation and Impermanent Push plans will look more like traditional project planning with deadlines, scope, task lists, and “deliverables” – especially in the short-term. We will also look at ways to make these plans more “agile” as life happens. By the end of this chapter, you will have a baseline plan for your change and a clear idea of your next steps. A lag measure is the measurement of your progress towards your achievement goal. Let’s say that our goal was lose 15 pounds in 30 days. This is an achievement goal. We can use a lag measure of the number of pounds lost since day 1. Remember: the lag measure is the measurement of the results you are trying to achieve. Essentially, the lag measure should show the progress towards your achievement goal. Lag measures show the results of your actions. The only problem with solely using Lag measures to see how you are doing is that you can’t change them after the fact. Furthermore, they don’t give you much information around whether what you are doing to affect that measure is working. Lead measures track the habits that lead to your achievement goal. Let’s say that you identified that keeping your caloric intake between fifteen hundred and two thousand calories daily as the habit you will track to lose the weight. This is your habit goal. The lead measure will be how many calories you eat per day and whether you follow your habit goal. The lag measure is the result of what you did for the lead measure. The lead measure is the thing you can influence! If you over-ate on Day 3, you can try again on Day 4! If you have guessed the habit goal right and are tracking the lead measure correctly, you will eventually see the results in the lag measure. Hopefully, in the right direction. What do you do if your habits don’t seem to lead you towards your goal? The lag measures don’t move, or worse – move in the wrong direction? Treat it like an experiment. Do I need to give it more time? There is often a delay between the lead measure and a change in the lag measure. Are you consistent with your new habit? Make sure you are not consciously or unconsciously gaming the system. Do I need to try something else? Maybe your guess on an appropriate habit was wrong. You now have the information to try something else. Each type of change has a slightly different emphasis on measures you need to use. Identify the type of change you are making and follow the instructions. Permanent Habit changes are all about performing a behavior regularly. Your main metric will typically be a lead measure – did I do the habit yes/no? 1) Determine your Lag Measure. What is a “successful” habit? 2) Determine the Lead Measures you wish to track. For a habit change, have your first Lead measure be a yes/no. I recommend having the “attempt” count as a yes, even if you didn’t get all the minutes, amount, or reps in. Have your second Lead measure be a number tracking what you actually did. You may find that 15 minutes of meditation is a bit much, but you are successful with 10 minutes OR that you can easily up your game and go 20 minutes without too much hassle. You can have optional Lead measures to keep track of how you feel after doing the action. For instance, you may have set up a habit goal of running 1 mile 3 days per week – but if you wind up feeling like you were run over by a truck after each run, that is information that could tell you that running might not be the best choice of activity and may not be sustainable for you OR that you may need to lower your sights to prevent injury. Lag Measure – How many days did I meditate this week? Lead Measure – Did I meditate today yes/no? If yes, how many minutes? Optional Lead Measures – If I meditated but did not make my minute count – what distracted me? What time of day did I meditate? Example: Go to the gym 3 days per week and do at least 30 minutes of exercise. Lag Measure – How many days did I go to the gym this week? Lead Measure – Did I go to the gym today yes/no? If yes, what did I do and how long did it take? Optional Lead Measures – How did I feel during? How did I feel afterwards? These optional Lead measures allow you to evaluate whether your choice of activity makes you feel good enough for you to want to continue. When considering the short-term, an Implementation change will have three pillars – Time, Scope, and Resources. In project planning, one of those pillars is fixed. The other two change to match that pillar. For personal Implementation change, the fixed pillar in your short-term push is most likely going to be scope (I need to lose 100 pounds). As you move towards the long term, you need to consider what you need to maintain, the resources you will need for that maintenance, and the day-to-day time and energy required for that maintenance as you work to maintain the change for the long-term. Lasting change truly happens in the day-to-day. The measures will change as you move from the initial push to operations. You will want to create Lag and Lead Measures for the short-term to start, then the long-term. 1) Determine your Lag Measures. What is your long-term goal? What is the change you are maintaining? The Lead measures are the habits that will support you as you move towards your goals. What are the short-term habits that will support your initial goal? What are the habits that will allow you to maintain that change? Lag Measure – How much weight have I lost so far? Lead Measure – Did I exercise today yes/no? If yes, how many minutes? What did I do? Lead Measure – What did I eat today? How much? Lag Measure – How much do I weigh right now? How far am I from target? What is the trend? With an Impermanent Push, in most cases you are working with a deadline. The fixed pillar is often time. A common planning method is to take the deadline and success criteria and work backwards from that date. By doing this, you learn whether your target is realistic in the time you have and what a realistic scope or timeline might be. For instance, if I am going from couch to 5K, I set my sights for running a 5K in 3 weeks, and I haven’t done anything that resembles cardio since high school, I might need to change either my timeline and target a 5K in 3 months or my scope and plan to walk that 5K rather than run it. If I am planning to run a 5K and I’ve been doing CrossFit for 2 years – running a 5K in 3 weeks is likely a no-brainer. The 3 weeks will be spent focusing on running technique. Your scope may change to allow you to challenge yourself – such as trying to run that 5K in under 30 minutes, or choosing to run a 5K in the Colorado mountains at altitude. Some impermanent push changes have other fixed pillars. Your fixed pillar may be scope (I plan to write a book) or resources (I have $1000 to write, publish, and market content that will help to provide passive income). Be clear on what your fixed pillar is for your push and what you intend to get out of it. With Impermanent Push changes, you may need to consider an off-ramp. Once you have achieved your goal, is there something you need to do to continue the effort? Another phase in the project? Or do you need to consider how you want to spend the time now that your impermanent push is done? Lag Measure – Did I successfully run a 5K? Lead Measure – Did I run today yes/no? If yes, how far? Do I wish to continue running as part of my exercise program yes/no? Is there another goal I wish to pursue to replace the training time for the 5k? Example: Write a book to support a side-hustle that will turn into a retirement career. Lag Measure – How many pages do I have written? Is this chapter/section done? Lead Measure – Did I write today yes/no? If yes, how many pages? How many books have I sold? How much have I made as a result of the book? How many prospective clients have I attracted as a result of the book? Did I market the book today yes/no? What did I do? How many prospective clients have I talked to today? In business, these are the projects that just won’t die, even though it is obvious that they won’t receive the return on investment they anticipated. Personally, this looks like continuing with a degree program where you hate the topic, but you are “so close to graduating” or continuing training for a marathon despite being crippled after each attempt at a 5-mile run. Each project has an opportunity cost. Some projects are more easily quantified than others. I recommend doing this for any change effort that has significant up-front costs in money and/or time. These will likely be Implementation efforts (such as exercise plans and diets) or Impermanent Pushes (such as going back to school or training for an event where you do not currently have the equipment). Opportunity costs above 1 are high opportunity costs. The sacrifice is greater than the gain. Opportunity costs below 1 are low/positive opportunity costs. The gain is greater than the sacrifice. Let’s use the example of writing this book. To write this book, I need to be clear on what I am sacrificing and what I am gaining. – The proposed cost for turning this into a book. I’m using professionals to help me do this. You could do this cheaper. I’ve budgeted about $5000 for production, then annual marketing and printing costs in subsequent years. – My labor cost involved in this writing. If I’m assuming $75/hr and writing the book is taking me 1000 hours, that’s $75,000 I’m giving up that I could be using to make $75 an hour. – This is also time that using to work on the book and not do other things, such as find other contracts, market services, spend time with my family, and hobbies. This is 18 months to 2 years that I will not be getting back. – Potential new clients as a result of the book. I’m expecting to double my income from my average year as a consultant. The first year is very low since I did not work much outside the book writing. – Improved skills that increase my value and allow me to increase my rate. A standard rate for consultants with my skillset and experience where I live (outside Washington DC) is $125 - $150/hr. - The passive income of the book itself. I’m not putting this in my calculations. - For a rough number, I am going to calculate about $200,000 for the total gain. I have had a year like this in my business, but I am seeing this book as a way to make this money in a sustainable manner. Implementation year – (5,000 + 75,000) / (50,000 + 50,000) = 80,000 / 20,000 = 4. 1) The opportunity cost on this project has been (and is) very high. I could have mitigated this opportunity cost by working a lot more – but I made a conscious decision, based on some other variables, to reduce the amount of work I took on during this process. It is a significant risk and not one I would generally recommend unless you have other forms of savings you can leverage. 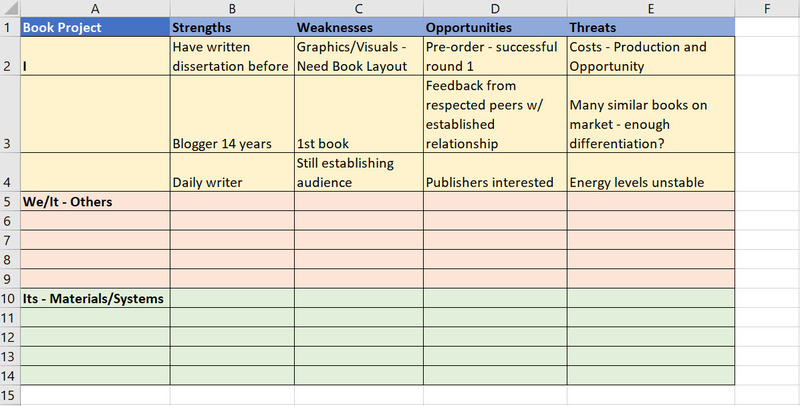 2) I am gaining significantly more than I am losing once I complete the book process. Admittedly, the numbers are optimistic – but I know from my prior experience that they are achievable for me. I can also look at how much I stand to gain or lose. Implementation year – I am sacrificing my labor $75,000 + labor cost for setup and publication ($5000)) and stand to gain $20,000 in paid work I am taking on. So the total loss is $60,000. Ouch. Thankfully, in subsequent years, since I will be able to take on more work at a higher rate ($200,000) and I am only losing $5000 per year in marketing costs, I’m gaining $195,000 per year! Notice that these are financial costs and not necessarily the emotional costs of change. With a high implementation cost, and upon further reflection, I probably should have paused before writing this book – or figured out a better way to reduce that up-front opportunity cost. Plus, the subsequent opportunity cost may not necessarily bear out. That’s a risk I’m willing to take. Unlike in business, there is an unquantifiable benefit to this project both in what I have learned during the process and in the feeling of accomplishment afterwards. You may run the numbers for your project and find that the aggravation isn’t worth the opportunity cost. Sometimes, you don’t get the return on investment. Sometime, the circumstances of your life make it the wrong time to pursue this goal. Sometimes, everything just works against you. Sometimes, you continue to bang your head against the wall in the hopes that if you keep using your head as a hammer, the wall will eventually break. One of the ways to minimize the appearance of the sunk cost fallacy is to pre-determine your outs. You do this by consciously selecting times when you are going to evaluate what you are doing and deciding whether to keep going. Milestones are great opportunities to ask yourself whether it is worthwhile to continue or to identify adjustments that need to be made. How long did it take you to reach that milestone? What money and resources did you wind up using to get there? Is it what you predicted? Does the trend look favorable for success if you continue? If you decide to continue, what adjustments do you want to make? Quarterly reviews are also a good time to make this evaluation – especially for Permanent Habit changes or longer-term efforts. 12 weeks is usually enough time to determine whether a program or plan is working. You are not quitting too soon because the going got tough. I find that within the 12-week period, I’ve seen most of the obstacles that might hinder my progress. 12 weeks is enough time to see patterns surface. Many of the same questions apply. Are you where you expected to be at this point? What money and resources have you used? What opportunities and threats surfaced? Is it worth it to continue and, if so, what adjustments do you need to make? This is a challenging conclusion. Second, because we live in a “failure is not an option” culture. Third, because quitting may challenge a value or a belief we hold. Fourth, because others are either relying on us to succeed OR expecting us to fail and we don’t want to prove them right. By pre-determining your outs, you can set the appropriate expectations both for yourself and for others up front. Each activity and project we take on is an investment. Each of us only have 24 hours per day and a limited number of days in this life. There is no point in continuing an activity if you have made your best effort over an extended period and you are not seeing the return on investment you expect. “Failure” is an invitation to take another path. I like defining two completion states. Ideal State – We have a clear “definition of done” and acceptance criteria. With this, we can measure progress towards that state. Stop-Work State – If we hit any of the identified triggers, it’s time for us to stop and reassess what we are doing before we get into big, expensive trouble. Recently, I worked on a resource management solution with a few friends. This solution is meant to be a low-effort prototype. This is an experiment to see whether we can create something useful with what we have on-hand. If it goes well – we can evaluate whether this is something we can scope for a larger audience. If it doesn’t – we’ve learned some things. Because this is a project with no budget and sweat equity – it was important to make sure we had both our ideal state and our stop-work states defined. I’ve seen too many people spend time and money on a passion project, get some users, and watch money vacuum out of their pockets as they operate the thing. When it started getting expensive to operate, they struggled to monetize it – because their clients really liked free. Not a position I want to put myself or my friends in. The triggers in the stop-work definition are where we would need to start spending more than personal sweat equity. We also thought that if we hit one of those triggers – it was a good time to look at whether this solution can be funded and has a potential business model. Better to find that out early, before we generated significant sunk cost. Grab your Change Planning worksheet. We are going to focus on the initial What You Have and What You Need passes. I find that revisiting these questions in a different format helps to uncover more information and allows us to surface next steps. When performing this SWOT Analysis, I invite you to write down the assumptions you are making as you engage with this analysis. Leverage the information you gathered during Pass 3 (What I have) and Pass 4 (What I need). What strengths do you have that will help with this change? What are you working with? How do you want to leverage these strengths to be successful? Where are we weak or missing information, resources, skills? What can you do to mitigate these weaknesses? What opportunities might surface as we execute on this change? Is there anything on the horizon that could help us with this change? Think both short-term and long-term. The picture below is a brief example based on this book project. I suspect your example may be more comprehensive. Now that we have an idea of what we are working with, let’s create the plan. In Chapter 5, we identified three common types of personal change and I asked you to consider the type of change you are making for this effort. We need to create the plan based on the type of change we wish to make. As a refresher, the definitions we are using are below. Permanent habit – A concentrated short-term effort to establish a new habit. Example: I plan to start a 15-minute meditation practice each morning. Implementation - Implementation requires a short-term push to get things moving, then an operations component that differs from your current state and from that short-term push. Example: I am going to follow a paleo-style diet to lose 30 pounds and intend to maintain the weight loss through eating natural foods and exercising. Impermanent Push - Focus with a specific event, goal, and/or date in mind. There is no planned operations component. Instead, we are going to plan an off-ramp. Example: I am going on a week-long canoe trip in July and I need to train for stamina, strength, and back health. Underlying ANY change is a series of behaviors and choices about executing those behaviors. Remember BJ Fogg’s Behavior Change formula? "Behavior (B) happens when Motivation (M), Ability (A), and a Prompt (P) come together at the same moment." We want to identify the Behaviors (B) we wish to adopt, check our Motivation (M) to perform that behavior, make sure the behavior is within our Ability (A) to perform it, and determine our Prompts (P) that let us know that we are at a decision-point as to whether to perform the Behavior. As we plan this, we need to make sure our new behaviors move us towards the desired outcome. Our lag and lead measures that we identified earlier will help us see whether our behaviors are working. Review your Lag and Lead measures. The Lead measures should contain the behaviors you wish to adopt. Why am I making this change? Go back to your “Why” that you defined in Chapter 2. What is the short-term reward for this behavior? What is the longer-term reward for this behavior? What is my probability of successfully executing on this behavior? If it is less than 90% - is there a way you can re-define the behavior to increase your chances of success? Example: Target behavior is 15 minutes of meditation each morning. I’m only successfully doing 5 minutes every other day. Can we use this to start the habit and increase once 5 minutes every other day becomes automatic? Is there anything that will hinder my ability to perform this behavior? Example: Partner wakes up early or I wake up late. Dog decides it needs my attention beyond the usual morning drill. What will prompt me to perform the behavior? What is my cue? Example: When I put on my clothes for the day and move to the living room, I will meditate for 15 minutes. If the behavior is a decision (e.g. I will eat a salad instead of a hamburger), what prompt do you need to remind you that a decision is in front of you? If the behavior is a step in a project plan (e.g. I will write 1 chapter per 2 weeks), what prompt do you need to remind you to do the work? Place this information next to your metrics. Especially in the early days of this change (the first 12 weeks), keep track of your daily activities around this behavior. Is what we are doing moving us closer to our goal? Each week, determine whether there are any adjustments you need to make. Are you seeing the prompts and neglecting to do the activity? Do you need a stronger prompt? Are you struggling to find the time to perform the activity because you keep getting interrupted by other people and priorities? What do you need to do to set boundaries around that time? Are you procrastinating on the work? What do you need to do (or who do you need to recruit) to ensure that you are doing the work? Remember, people are watching whether we want them to or not. I don’t say this to make you (more) paranoid. Others are watching us to see whether we are doing what we say we are doing. What are we modeling to others? We don’t need to say anything, explain ourselves, argue for what we are doing, or listen to the haters. You only have control over your actions. You do not have control over the thoughts, opinions, and behavior of others. Let your results and your actions speak for themselves. Even if we have done something before, there is always more to learn and skills to sharpen. There is another level of mastery we can attain. As we work through this change, we may find that there are knowledge gaps and skills we need to develop or sharpen. We may discover that another level of mastery is required. If we aren’t sure what knowledge and skill gaps we have when we plan our change, it is almost certain that these gaps will show up in execution. You may have heard of the Competence Ladder or the Competence Matrix. Unconsciously Unskilled – You don’t know what you don’t know. You have a lack of knowledge or skills in a certain area and you may be wildly over-confident about your abilities. Some people are more aggressively overconfident than others. Consciously Unskilled – The uncomfortable feeling that you really don’t know what you are doing in this area. This is part of the “dip” in Fisher’s Change Curve. The universe is vast. We can’t know or be skilled in all-the-things. This is the time to recruit friends and mentors to help us. This is the time to remember that change is challenging, learning is uncomfortable, and it is all part of the process of moving from unskilled to skilled. Consciously Skilled – You are acquiring the skills that you need and are consciously applying and practicing the skills. You may be looking for opportunities for practice. There is significant concentration and cognitive load involved at this stage. Unconsciously Skilled – You are using your skills without thinking about it. You are confident that you can use these skills successfully and in the right way. You may also be in a position to teach these skills to others – which is a great way to deepen your mastery. Change moves you through all these steps in the ladder when done successfully. For myself, I find that maintaining “beginner’s mind” and re-visiting Intro-level training on occasion helps me deepen my mastery in areas where I have developed skills. I also try to remind myself that just because I happen to have a couple of graduate degrees and some certifications does not mean that I have skills in the area in which I am working at the time. My PMP (project management certification) does not mean I am a skilled health-care practitioner or a master electrician or an engineer. My ego will, occasionally, get the better of me here. Particularly in areas where I had practiced at one point and it has been awhile. Consciously remembering “beginner’s mind” – even in areas of mastery – has been a huge help. Like your change, you can “ladder” your knowledge and skill-building so that it isn’t so overwhelming. Focus your efforts on the Knowledge and Skills that will help you with this specific change effort. Recently, I had some blood tests run that showed that my cholesterol is uncomfortably high. I know high cholesterol runs in my family. I would rather make dietary changes than start taking pills. As I write this, I have some work to do. I need to do some research on what foods help with cholesterol control and eat more of those. I don’t know whether there is an exercise component to cholesterol control that I need to address that isn’t addressed with my current workout program. At this writing, I have a nightly mint chocolate chip ice cream habit. I’m pretty sure mint chocolate chip ice cream is NOT cholesterol control friendly. I live on the East Coast. Friendly’s, Turkey Hill, Baskin Robbins, and Haagen Dazs all make great Mint Chocolate Chip ice cream. Breyer’s used to be good, but they have over-aerated and watered down their ice creams over the past few years. Baskin Robbins’ seasonal Peppermint ice cream is also delicious This is solely my opinion – YMMV. I may need to adjust how I cook. I don’t know what I don’t know here. There is likely some negotiation that needs to occur with my partner as I shift my cooking. He eats what I cook. I did one brief stint with the Paleo Diet back when I was doing CrossFit and it didn’t go very well. I wound up demonstrating disordered eating patterns that resulted in me losing 17 pounds in 17 days. At the time, I didn’t have 17 pounds to lose. That experience taught me that I need to be careful with any strict diet program and I need to watch myself for orthoexia. https://www.nationaleatingdisorders.org/learn/by-eating-disorder/other/orthorexia. Many people do fine on Paleo and Keto and other diets. This is just my personal experience. Work with a dietician or other professional nutrition specialist to find a diet that works for you and your goals. Research what a cholesterol-control diet looks like. (Pray it involves mint chocolate chip ice cream). Measure that diet against my current food consumption patterns. Determine the 90% habit that I think I can execute. Execute and see what happens. My “out” is if I start demonstrating either anorexic or orthoexic eating patterns. If successful at the habit – add another behavior or increase the frequency of the same behavior. Continue until my cholesterol levels go down to more reasonable levels or if I had to stop for health reasons. I still need to research what a cholesterol-control diet looks like – but I suspect it may mean more salads and less mint chocolate chip ice cream. Since I know my current diet has at least 1 salad per week – I may set my first behavior change as “eat 3 salads per week.” I’ve done this before, so I know it is at least 90% likely that I will be able to execute this behavior. At this writing, I need to determine specifics around what those salads should look like. I suspect “egg salad with blue cheese dressing” does not count. Ability (A) = I have done this before, and I am 90% certain that I can do it again. The challenge might be recruiting support from my partner since we eat similar foods at mealtime, and it has proven to be a bit too easy for us to pull each other off-track out of laziness or a desire for fast food. Prompt (P) = My best prompt is dinner (I generally start cooking dinner around the 5pm hour) and making sure that the veggies for the salad are visible and not hidden in the crisper drawer. Once I figure out what I need to do and what knowledge and skills I need to be successful – I can start setting myself up for success. All change results in learning. The larger the change, or the less confident we are about successfully making this change, the more we need to set ourselves up for success. Prong 1 – Collect information – get the lay of the land. We have been doing this throughout this book, but we are going to dive a little deeper. Prong 6 – Share what I’ve done into the big scary world. Through these 6 prongs, I am gaining knowledge, applying what I learn, and practicing for mastery. Let’s talk about these 6 prongs in turn. I’m going to use my attempts at learning sales and marketing as our example. This is the easy prong for me. I can read books and consume media happily all day. It’s easy for me to mistake “research” for action, or learning. Thankfully, I’ve spent a lifetime learning and unlearning. I’ve approached even the most uncomfortable topics with the idea that I can at least become passably OK at whatever it is I’m trying to learn. Some topics, I find it’s easy to figure out where the “beginning” is and put together the learning plan from there. Foreign languages, for instance, have a consistent start point and a clear learning path. Other topics, like sales and marketing, generate significant noise. Each person has his or her “best” way. The result is a lot of conflicting information. Add to that the internal noise I generate when I am trying to learn things in areas I’m not entirely confident I will master. Or, as is the case with sales and marketing, have reservations about the endeavor. When I’m starting from “dead beginner” status – I’ll typically look for “Introduction to…” or “…for Dummies” type books. The general overview. I’ll then look at the “classics” and most cited. Is there something in that information I can hook into from my past experience? What can I immediately leverage? What actions can I take, and how quickly can I take them? Where am I finding agreement or resistance to the information? What trends am I seeing? As I dig into the information and gain more clarity on my personal goals for learning this skill, I can start work on the other prongs. This is where our work earlier in the book also helps. This work is part of the information we need to succeed. Glance over your Strengths and Weaknesses for your change project. What knowledge gaps have you identified? What are your next steps for finding this knowledge? Is there someone you can talk to who has this knowledge? What skill gaps have you identified? If I need to build this skill, what are my next steps? If I can “outsource” this skill – who do I need to talk to? What opportunities will I have to practice and apply any new skills and knowledge? Now that you have identified what you consciously know you don’t know, let’s do some research. I’m going to use my “lowering my cholesterol” example to help guide you through this process. Before you get started – what do you EXPECT to find? I want you to be clear on this before starting because we tend to bias information that matches our expectations. Example: I expect to find that mint chocolate chip ice cream is NOT on the cholesterol control diet. I expect to find that I am supposed to eat a lot of salads and oatmeal. What do you already “know”? Example: I know salads, especially ones that are almost all vegetables and use oil/herb/vinegar dressings, are good for you. I know most fast food, typically, isn’t. What do I know I don’t know? If you wish, write down your questions. This will help guide your research. Example: How does coffee impact my cholesterol? Do eggs impact cholesterol levels? Does meat impact cholesterol levels? If so, which cuts and what should I look out for? Is organic food better for my cholesterol levels than more easily accessible food sources? I know some of these questions may be triggering. I think it is important to meet people where they are at. Furthermore, organic food accessibility varies wildly. For my part, I am an omnivore. My personal dietary mantra is “Eat real food, minimize processed things.” I am NOT a dietician or nutrition professional. I do my best to give thanks to the animals who have sacrificed for my nutrition and, because I occasionally lean towards orthoexia when I am out of mental balance, I try not to be too stringent on my diet. Do what is right for YOU. As you do your research, check your sources. What are your source biases? You don’t have to drill down too deep since we are just getting the lay of the land and NOT writing a research paper. Example: Let’s say I’m researching information on how eggs impact cholesterol levels. The information from the American Egg Board is likely to be more biased than information out of a research team at Purdue University. The 1st link came from the Mayo Clinic. When I did a brief mental check for source bias I figured that the Mayo Clinic link probably pulled their information from multiple sources and that the individual writing the article was an MD who used this information to help patients. I was not disappointed. I learned that according to this doctor, I can eat up to 7-8 eggs per week, but I should probably lean towards egg whites. The 2nd link was from Healthline. This source cited a wide array of other studies published in respected, peer-reviewed journals. Taking a quick glance at the citations, it appears this author summarized the research correctly. His over-arching conclusion – I can eat up to 3 eggs per day, with some risk of my LDL cholesterol going up. This maps to my current egg consumption. A 3rd link appeared from the Heart Foundation. I figured this source would be anti-egg. Thankfully, I was wrong. They are anti-bacon. https://www.heartfoundation.org.au/healthy-eating/food-and-nutrition/protein-foods/eggs. Full disclosure: I like bacon. The Heart Foundation’s conclusion was not a surprise to me. Conclusion: Eat eggs, skip bacon. Example: For myself, this research means I will continue my 2-egg omelet consumption. I will adjust my omelet recipes so that I have more vegetables in my omelet. I can use herbs (dried or fresh) instead of cheese and bacon to flavor the omelets. I like these types of omelets so I can confidently include this as a 90% habit. It is not a major adjustment for me. My partner, who also eats these omelets, is on board with this plan. This will make the adjustment easier. I will need to keep track of how this adjustment impacts my cholesterol levels. This one is a bit trickier for me. I’m not good at asking for help. As I learn sales and marketing, finding a mentor provided a greater challenge than usual. Most of my closest friends have the same problem I do – sales and marketing are not natural acts. Furthermore, the best salesman I know is my brother, and though I can ask him advice, he’s a natural. He probably thinks my struggle is ridiculous. I’m also not good at receiving advice from people close to me. This is why I don’t ask my partner for golf tips (even though he is a fantastic golfer). I know myself well enough to know that I’m going to resist. I prefer to keep my relationships with both my brother and my partner strong. No point in testing those bonds because I’m suffering from the “familiarity breeds contempt” fallacy. The sales and marketing mentor I found is completely outside my network. This works for me because he doesn’t need to be my friend. Plus, he’s been there. He’s made the mistakes. He’s far enough along that he can guide, but isn’t so far along that he can’t relate. And he holds me accountable. This has been critical for the “hard” activities. I’m great at procrastinating when I have to reach out to people or release projects I’ve been working on forever. Mentorship provides the accountability that is absolutely critical for learning a new skill and feedback from someone who has already done the work multiple times. In my case, my mentor has also talked me down from a few fear-based freakouts. I haven’t been the best student. Who, in your earlier analysis, can serve as a mentor? Bonus points: Go ask this person to help you and help you be accountable for this change. Example: In the cholesterol-control example, the resident I am working with for my primary care (my doctor works at a teaching hospital) is going to be my mentor / accountability partner. If you are making a change that impacts your health – mental or physical, I strongly recommend recruiting a professional. I do best when I know what steps I need to take and, for the scary bits, those steps are small enough that I can do that step today and celebrate the fact that I’ve taken the step. Is this quick? Nope. I’m making progress. Days when I am feeling more confident about what I am doing, I get more steps done. Days where I am not right in the head – at least I did something. I count that as a win. Learning sticks when we apply it. Not just when we hoard information. To that end, I create small, low-risk projects for myself to start. What that looks like will vary for everyone. As I get more comfortable, I increase the risk and scale. For instance, creating a marketing architecture and plan requires a number of small steps and deliverables attached to those steps. Small, higher risk – ask people to join the list. Again, a deliverable with a measurable outcome. How many people are on your list (that is not you and your testing accounts)? The risk is in the ask. Getting over the fear of asking and what people will think of you. Some of us have an easier time with this than others. Slightly larger, slightly higher risk – ask people you don’t know very well to join the list. Yet again, a deliverable with a measurable outcome. This time, you can work with lag and lead measures. Lag measure – how many people are on your list? Lead measure – how many people did you ask today? This is the deliverable I am currently working on. Eventually – I will have enough information to be able to see a percentage of the number of people I asked vs the number of people who signed up. When done well – you can work up to large, multi-deliverable projects at a significant risk level. Unfortunately, many of us try to go big right out of the gate. In my experience, 9 times out of 10 that is a huge mistake. Failing big makes it much harder to try again. Not only have you burned yourself out, you have also damaged your goodwill with others. Don’t under-estimate the power of small, low-risk projects. Those projects provide valuable information. I try to design a tangible deliverable in all my change projects. 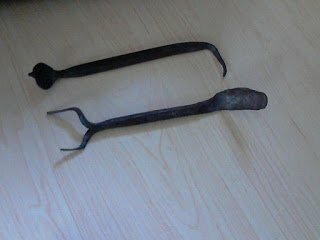 Top (first attempt at blacksmithing) – choose your function: dental/torture device or leaf-tipped steak turner. Bottom (second attempt at blacksmithing) – early prototype, artisinal spork. – the dreaded PowerPoint file…. Then there are even less obvious tangibles – but that others can still see. – Conversations and the physical act of speaking with another. This last idea I am still wrapping my head around…. Perpetual Beta – Everything is an Experiment. – The Business Intelligence Unit moving to an Agile development process model and attempting to drag the rest of the IT department kicking and screaming with it. – The boat that Megan and I developed finishing the creek course TWICE (albeit not very quickly). Because we got our feet wet at the beginning of our development process. – The continued development of the artisinal spork. I think more blacksmithing courses are in my future to learn more about how iron behaves and the choreography of the craft. I’m finding the faster I attempt to make something real, then try again, the faster I improve. The more time I spend staring at my navel THINKING about making something real – the slower improvement comes. It took me 42 years to figure it out and another 6 years (at this writing) to prove it to myself. Include your lag metrics and lead metrics. Lag metric: Overall Cholesterol level, HDL level, LDL level. I get these from my Doctor. Lead metrics: Did I eat a cholesterol friendly meal today – yes/no? Bonus Lead metric: What did I eat today? Optional: How much? I personally don’t keep track of how much I am eating. I’m fortunate in that I have a solid hunger / satiety reflex. Most nutritionists will ask you to keep track of amounts – either by volume or by weight. If I have 1 cholesterol-friendly meal and everything else I eat that day includes bacon, I have probably not done myself any favors. Deliverable 1 (Lead Metric): A cholesterol-friendly meal. This will help me see whether I understand this new skill (cooking and eating in cholesterol-friendly ways). Deliverable 2 (Lead Metric): Food tracking – I’m doing this in my daily planner notebook since it is something that is in front of me and that I am already using every day. I can then share this with my mentor (the resident) next time I see her. Deliverable 3 (Lag Metric): Blood test. This will tell me whether what I am doing is helping or if I need to make adjustments to my plan. I will be taking another fasting blood test in 6 months. New learning needs safe spaces to allow for experimentation and development of stability. New learning is scary – why make traversing the dip more challenging than it needs to be? This is where I recruit supporters and allies for friendly experiments. These are trusted friends who I know have my best interest at heart. I’m blessed that these friends are also really smart – I get good feedback from them. That safe space allows me to practice and solidify the new learning before going out into the scary world. For my marketing efforts, I decided to approach safe space creation in three ways. First – through my entrepreneurial friends. They can relate to the need to market (and the resistance that pops up). We are also not competing for clients. They have provided sound, actionable feedback and encouragement. Second – through my “target market” friends. They look at my materials and tell me whether they work for them. They provide a good place for me to experiment, tell me whether I am hitting my mark with my service, and whether I am helping. They get free help, I get practice. Everybody wins. Third – through a small mastermind group. This is a higher risk approach, but one that I needed to add to my safe space. I needed a group of people who don’t know me to give me feedback. We are all trying to do the same thing, so they can relate to the struggle. They also haven’t heard my attempts to explain things umpteen-million times, so they are approaching my work with a fresh eye. I consider this “coopera-tition.” We may be competitors, but we can help each other too. This has the added benefit of growing my network. I have no problem with forwarding potential clients to any of them if that client would be better served through their services. I can’t emphasize enough how important having a safe space to practice is. For those struggling with addiction, the most powerful thing a 12-step group can provide is a safe space to practice. Therapists provide safe spaces to heal. Gyms (should) provide safe spaces to practice new fitness behaviors. If you wish to create a learning organization, the organization has to be a safe space to practice. If you want a coaching culture, coaching interactions need to be safe spaces. These safe spaces can’t be “separate and apart” from the day-to-day. Google discovered during their research into high-performing teams that the #1 most important predictor of team success was psychological safety. Is a team a safe space for risk-taking in the face of seeming incompetent, disruptive, negative or ignorant? If you are in an environment that fears failure, is highly competitive, and has no patience for experimentation – even those “safe spaces” aren’t safe. Unfortunately, we have to figure out how to find those safe spaces ourselves. What safe spaces (people, environments, groups) have you identified to help you with this change? What is your next step for engaging this safe space? Bonus points: Go visit or ask! What did you learn? Example: I consider myself very fortunate that I can work with my partner to make my home a safe space and practice environment for this cholesterol-control diet change. Other options for me include: the doctor’s office. I could also engage in certain Facebook or Reddit groups centered around nutrition. Vet these groups carefully to make sure they are truly a safe space for you. Does it include professional practitioners? What is the tone of the group? Are the community-members positively supportive? How much drama is in the group? How well is the group moderated? Are the moderators active or is it a free-for-all? How do they deal with disagreements in the group? How do they deal with negativity? How do they encourage the group members? Treating my marketing and sales activities as experiments helps me get stuff out there and reduces the resistance (a little). Do (sales and/or marketing) thing. That doesn’t always stop me from procrastinating. That’s a fear/resistance thing. This is why the mentor in Prong 2 and the friendly safe space in Prong 4 are so important. They encourage me to get over the fear and resistance. Maybe one day I won’t need to lean on those prongs so much. I’m not quite there yet. It will take more cycles. It’s part of the mastery process. This is more of an activity for execution, but I would like you to consider how you can help yourself maintain this mindset. Give yourself a few days to look for patterns. Many of us have been taught that mistakes are bad. Many of us live and work in cultures where “failure is not an option.” Those of us with strong perfectionistic streaks and/or highly vocal inner gremlins (like myself) may find this practice deeply uncomfortable. Recruit help if you need it. Do your best to watch your thoughts over the next few days as you start practicing your new habits. When do you start feeling down about yourself? How are you reacting to “mistakes” or “failure” to practice this new habit? How do you intend to share what you learn? Optional: To a defined audience? You do NOT need to advertise/write a public blog/write a book/turn yourself into an expert/turn what you are learning into a side-hustle etc. These are all options if you choose to take them. I’m asking you to take an outside perspective. Example: Admittedly, the example I am writing here IS my public sharing of the deliverable. However, another option is journaling my experience for myself with the perspective of “other.” I could also write a blog and not worry about metrics. I could even create a social media account separate from my day-to-day identity and make it private to just my support team. An easy, unspoken assumption I make when doing my personal resource calculations on a project is “I have all the energy and focus in the world to do this”. I’m also an admitted workaholic and want to believe I can do all the things in record time. I’m learning to slow down (admittedly with LOTS of help from friends) and ask some questions during my planning. How am I feeling? How is my general health? What else do I have going on? NOT just professionally, but personally? How many things do I have going on? How much cognitive load does each individual thing require? Because it is too easy to say “yes” to things I really don’t have the bandwidth to do. Particularly if I am trying to avoid something. It’s the same thing when estimating time and human resources for a project. In the workplace, I will typically get information on the number of hours per week the resource has on the project. It’s too easy, when a resource manager says “you have 20 hours of X’s time,” to assume that it is a highly productive 20 hours. How many other demands are on that person’s time in the workplace? If the person is pulled in too many directions – even if you are told “He has 20 hours for projects” – you may only get 10 quality hours. Is there uncertainty in the environment that impacts the person’s sense of safety? Recent reorgs? Recent layoffs? Pending layoffs? People just jumping ship? Is someone going through a major life change? Divorce? New (or very young) child? Marriage? Moving? Illness (theirs or loved ones)? All those events require energy, emotional bandwidth and cognitive load. Rightly. And it is all out of the same resource pool. Often, we tend to make our plans based on our best-case scenario. We’re feeling healthy, energetic, our best selves. We then make our plans and set our timelines accordingly. Then we beat ourselves up when the average to bad days kick in and we don’t get done what we intended to get done. Energy management is particularly acute for those of us suffering from chronic conditions or extended illnesses. We have good days and bad days. Sometimes, it’s tough to predict which days will be good and which ones aren’t. Sometimes, we don’t even know until we get started and realize that we either a) feel better than we thought or b) don’t. Sadly, b happens more frequently (at least in my life) than a.
I’ve been experimenting with leveraging the Scrum project management concept of “story points” as it applies to my personal projects. Second is figuring out my energy patterns and what a realistic cadence looks like. In Scrum – each sprint has a set of available points based on the cadence set by the team. In a personal context, you have a set of available energy points based on your productivity patterns. You then look at your “backlog” (or the “to-do” list) and assign “story points” (or level of effort points) to each task. Ideally, you match the tasks you intend to get done that sprint (or week) with the energy points you have available and the priority of the task. Example: I have a high story point task I need to get done this week (such as “Finish Chapter 3 of the book” – high complexity/cognitive load AND requiring lots of focus time). If I’m going to get that task done, I shouldn’t plan to get much else done beyond previously scheduled client work (which also takes up energy points). I might find a mindless, low focus, need-to-get-done task from my backlog to fill in extra time and get it off my plate – but only if I underestimated either my energy or the amount of effort the main task takes. Tracking my productivity patterns becomes especially important when I am going through a health flare-up, such as the back injury I was fighting last year or a visit from the Cookie-Monster Bathrobe. Instead of beating myself up over what I haven’t managed to get done, I use that information to set realistic weekly sprints for myself and resetting expectations. Any big change in your health or stress levels should trigger a re-evaluation of your energy points. Right now, I find myself saying “no” a lot more frequently – only because I don’t have my usual number of energy points to work with on top of having high story point tasks on my plate. I’d rather disappoint someone up front and find them a different resource that will help them with their issue than to promise something I can’t deliver. My ego hates this. I want to be able to do all the things at the pace my ego wants to set (which is instantaneous). When it gets right down to it, maintaining positive relationships by doing what I say I’m going to do when I say I’m going to do it to the best of my ability is more important to me than serving someone poorly. What are your current energy levels? What tasks are on your plate, how complex are they, and when are the deadlines? How do these match up in your life? We’re going to be considering variable energy as we move into breaking down our tasks. In the meantime, consider tracking your patterns over the course of the next few weeks. At this stage, I strongly encourage you to start practicing the habits you have identified. You don’t need to tell anyone what you are doing. I’ve personally found that in the early stages of any major change, stealth is a better way to go. Moving stealthily with my change allows me to experiment without unwanted “input” from others and allows me to get more comfortable with the change. Usually, the only people who know what I am doing are the people I am 99.9% confident will support and help me. I also recruit any necessary professionals – particularly if the change is fraught.